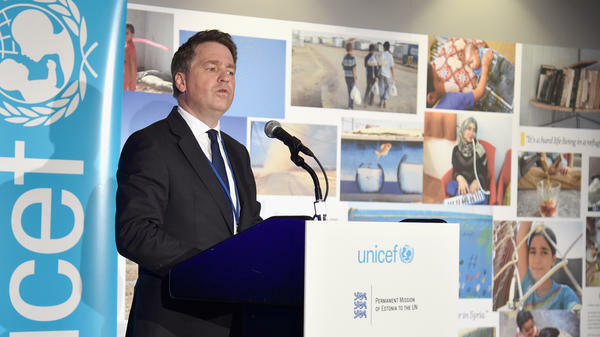 UNICEF Deputy Executive Director Justin Forsyth announced his resignation Thursday, saying in a statement, "I want to make clear I am not resigning from UNICEF because of the mistakes I made at Save the Children. They were dealt with through a proper process many years ago. I apologised unreservedly at the time and face to face. I apologise again." He said he was resigning because some media coverage of him is "not just to (rightly) hold me to account, but also to attempt to do serious damage to our cause and the case for aid." "I am resigning because of the danger of damaging both UNICEF and Save the Children and our wider cause," he wrote. "Two organisations I truly love and cherish. I can't let this happen." Save the Children U.K. said on Tuesday that "concerns were raised about inappropriate behaviour and comments by the then CEO, Justin Forsyth" in 2011 and 2015. Three women made three complaints, the organization said in a statement. After investigating the complaints, "reviews resulted in unreserved apologies from the CEO. All the parties agreed to this and the former CEO apologised to the women in question. At that time the matters were closed." But the organization added that more recently, additional "concerns were raised" and "a further review was required."